An Aramaic word contracted from "min gaw" (= "from within"), meaning to proceed from the content of a sentence or circumstance, and designating originally a conclusion based on analogy. It is used in this sense in B. M. 5b. If it be assumed that one has transgressed a commandment, and has taken money or property which does not belong to him, it follows that he may be suspected with regard to an oath, and that he is likely to commit perjury. Such a conclusion, however, is valid only when the breaking of a venial commandment is inferred from the violation of an important one, and not conversely (comp. Tos. B. M. l.c., catch-word "de-ḥashid"). Another example of the use of "miggo" in this sense occurs in Suk. 7a, where, from the assumption that a ledge is considered a wall in the case of a booth, the conclusion is drawn that a ledge is likewise a wall so far as the Sabbath is concerned. The Hebrew equivalent for the Aramaic "miggo" in this sense is "mittok," a contraction of "min tok" (= "from within"). An example of the use of this term occurs in Beẓah 12a, where, from the fact that work is permissible on a holiday when it is necessary for a livelihood, it is inferred that it is allowed also when it is not necessary for subsistence: "Mittok she-hutterah le-ẓorek hutterah nami shello le-ẓorek." 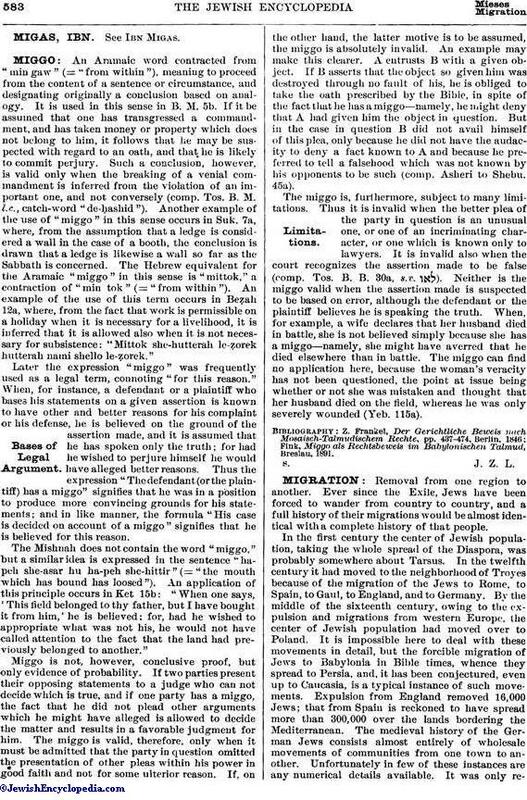 Later the expression "miggo" was frequently used as a legal term, connoting "for this reason." When, for instance, a defendant or a plaintiff who bases his statements on a given assertion is known to have other and better reasons for his complaint or his defense, he is believed on the ground of the assertion made, and it is assumed that he has spoken only the truth; for had he wished to perjure himself he would have alleged better reasons. Thus the expression "The defendant (or the plaintiff) has a miggo" signifies that he was in a position to produce more convincing grounds for his statements; and in like manner, the formula "His case is decided on account of a miggo" signifies that he is believed for this reason. The Mishnah does not contain the word "miggo," but a similar idea is expressed in the sentence "ha-peh she-asar hu ha-peh she-hittir" (= "the mouth which has bound has loosed"). An application of this principle occurs in Ket 15b: "When one says, 'This field belonged to thy father, but I have bought it from him,' he is believed; for, had he wished to appropriate what was not his, he would not have called attention to the fact that the land had previously belonged to another." Miggo is not, however, conclusive proof, but only evidence of probability. If two parties present their opposing statements to a judge who can not decide which is true, and if one party has a miggo, the fact that he did not plead other arguments which he might have alleged is allowed to decide the matter and results in a favorable judgment for him. The miggo is valid, therefore, only when it must be admitted that the party in question omitted the presentation of other pleas within his power in good faith and not for some ulterior reason. If, on the other hand, the latter motive is to be assumed, the miggo is absolutely invalid. An example may make this clearer. A entrusts B with a given object. If B asserts that the object so given him was destroyed through no fault of his, he is obliged to take the oath prescribed by the Bible, in spite of the fact that he has a miggo—namely, he might deny that A had given him the object in question. But in the case in question B did not avail himself of this plea, only because he did not have the audacity to deny a fact known to A and because he preferred to tell a falsehood which was not known by his opponents to be such (comp. Asheri to Shebu. 45a). The miggo is, furthermore, subject to many limitations. Thus it is invalid when the better plea of the party in question is an unusual one, or one of an incriminating character, or one which is known only to lawyers. It is invalid also when the court recognizes the assertion made to be false (comp. Tos. B. B. 30a, s.v. ). Neither is the miggo valid when the assertion made is suspected to be based on error, although the defendant or the plaintiff believes he is speaking the truth. When, for example, a wife declares that her husband died in battle, she is not believed simply because she has a miggo—namely, she might have averred that he died elsewhere than in battle. The miggo can find no application here, because the woman's veracity has not been questioned, the point at issue being whether or not she was mistaken and thought that her husband died on the field, whereas he was only severely wounded (Yeb. 115a). Fink, Miggo als Rechtsbeweis im Babylonischen Talmud, Breslau, 1891.